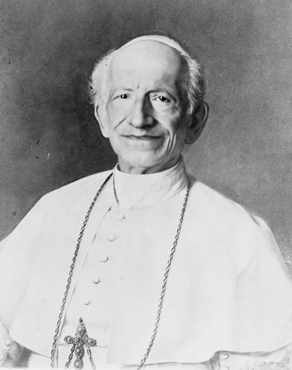 In the course of his Papacy, the fourth longest in history, Pope Leo XIII (1878-1903) issued eleven encyclicals on the Rosary, in the years 1883, ’84 and ’87, and then each year from 1891-98. All of them were published in September (except one, at the very end of August), looking forward to the feast of the Holy Rosary, which in his time was kept on the first Sunday of October. The feast was later fixed by Pope St Pius X to October 7, the date of the famous Battle of Lepanto which it commemorates, inter alia. Much of what Pope Leo writes is every bit as germane to the condition of society and the Church as it was when it was written over a century ago. The following is an excerpt from the 1891 Encyclical Octobri mense adventante, in my own corrected translation; on the Vatican’s website you can read the full text in Latin, and a rather sadly bowdlerized English version of it. At the coming of the month of October, which is consecrated and dedicated to the most Blessed Virgin of the Rosary, we are greatly pleased to recall how greatly in preceding years We have commended to you, venerable brethren, our wish that the faithful throughout the world, urged by your authority and by your zeal, should redouble their piety towards the great Mother of God, the mighty helper of the Christian people, and should pray to her throughout the month, and invoke Her by that most holy rite of the Rosary, which the Church, especially in uncertain and most difficult times, has ever used and celebrated for the accomplishment of all desires. This year once again do We take care to publish Our wishes, once again to encourage you by the same exhortations. We are urged and persuaded to this in love for the Church, whose sufferings, far from being mitigated, increase daily in number and in gravity. 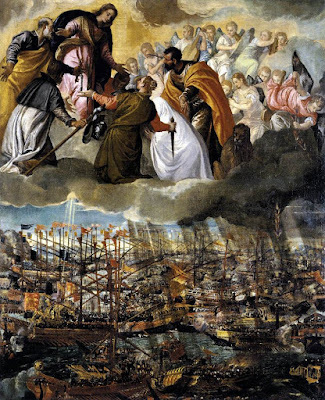 Well-known to all are the evils we deplore: war made upon the sacred dogmas which the Church holds and transmits; derision cast upon the integrity of that Christian virtue which she has in keeping; … attack made, with most impudent audacity and criminal malice against Christ Himself, as if to utterly abolish or destroy from its foundation the Divine work of His Redemption – that work which, indeed, no adverse power shall ever destroy. Now, among the several rites and manners of paying honor to the Divine Mother, since some are to be preferred, inasmuch as we know them to be more powerful and more pleasing to Her, for this reason We specially mention by name and recommend the Rosary … which recalls to our minds the great mysteries of Jesus and His Mother, their joys, sorrows, and triumphs... As the faithful devoutly call to mind and contemplate these august mysteries, it is wondrous to see how great is the aid they receive in the nourishment of their faith, in defense against ignorance and the disease of error, and in the lifting up and supporting of the mind towards virtue. Indeed, the thought and memory of him who thus prays, enlightened by the light of the Faith, are drawn towards these mysteries with the greatest joy and zeal, are fixed and absorbed therein, and cannot sufficiently wonder at the ineffable work of the Redemption of mankind, achieved at such a price and by events so great. Then the mind is filled with gratitude and love before these proofs of Divine love; its hope is strengthened and increased; its desire is increased for the heavenly rewards which Christ has prepared for those who have united themselves to Him by the imitation of His example and the sharing of His sufferings. Prayer is poured forth in the midst of these things by words coming from God Himself, from the Archangel Gabriel, and from the Church; full of praise and of saving petitions, it is renewed and continued in an order at once fixed and various, and the fruits of its devotion are ever new and sweet.